$850,000 USD Reduced Beach Front Home From $895,000! "Beautiful Ocean Front Home Tulum North "
This is a home full of charm and a piece of artwork, with Hacienda style architecture, this unique Ocean front Home for Sale Tulum North area has ceramic hand painted tiles from old haciendas in Yucatan, fine wood finishings, built in 9,390 sqft Ocean Front lot. Enjoy the view to the clear caribbean waters while having a glass of chill white wine at your terrace, feeling the ocean breeze or take your snorkel gear to find the marine life in the bay. All the house is now set in a single floor, featuring 2 confortable and convenient bedrooms with their own full bathrooms. 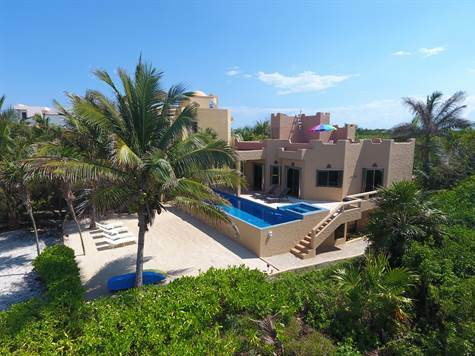 This Ocean Fron Home for Sale Tulum North has plenty of space if a you want to add a couple more bedrooms in the second level, preparations are ready in the structure. Terrace, nice size pool, jacuzzi, sandy lounge area with palm trees, kayaks are just a few of fun features of this amazing Ocean Front Home for Sale at Yucatan Península. Huge storage area, laundry room, machine room and even can accomodate service room at the basement.